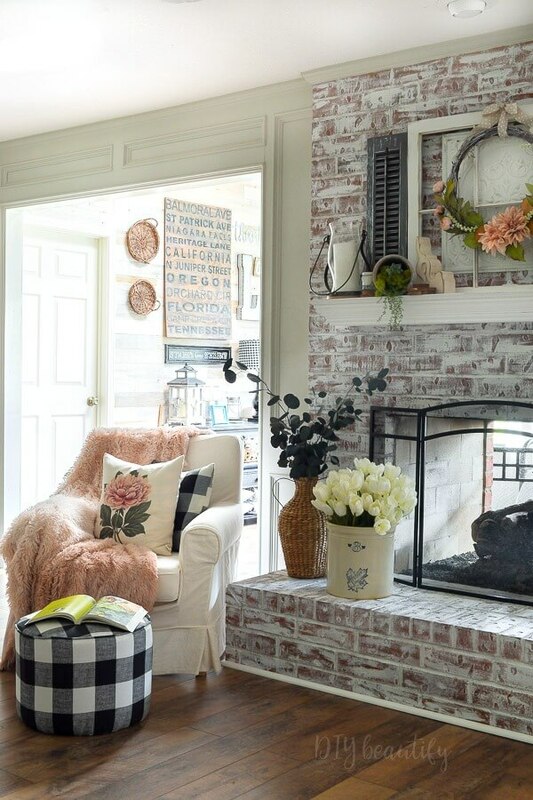 A Spring inspired mantle layered with vintage elements and soft colors for beautiful texture! 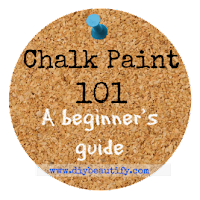 I'm sharing all the things that went into this easy project. 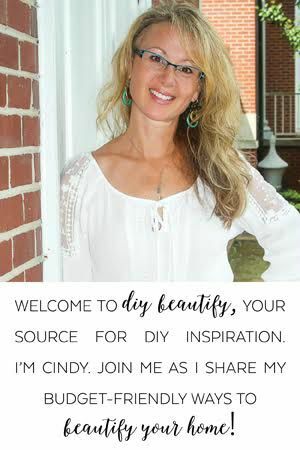 I am joining a wonderful group of talented bloggers for a week full of Spring inspiration! 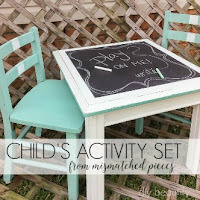 Thanks so much to Kendra of Joy In Our Home for coordinating this Spring Festival Blog Hop! I will share all the links at the end of my post...today's focus is on Spring mantles! I love contrasts. Dark and light, soft and structured. There's just something about contrasts that makes me happy. My eye is drawn to all the various elements and it's a joy for the senses! I added lots of contrasts to my Spring decorated mantle. 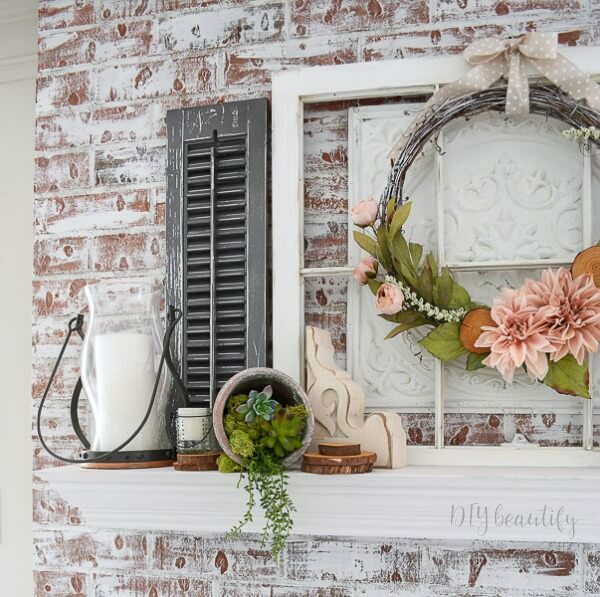 I knew I wanted to include one of my Spring DIY wreaths with blush flowers on my mantle...that was the inspiration for this whole space. 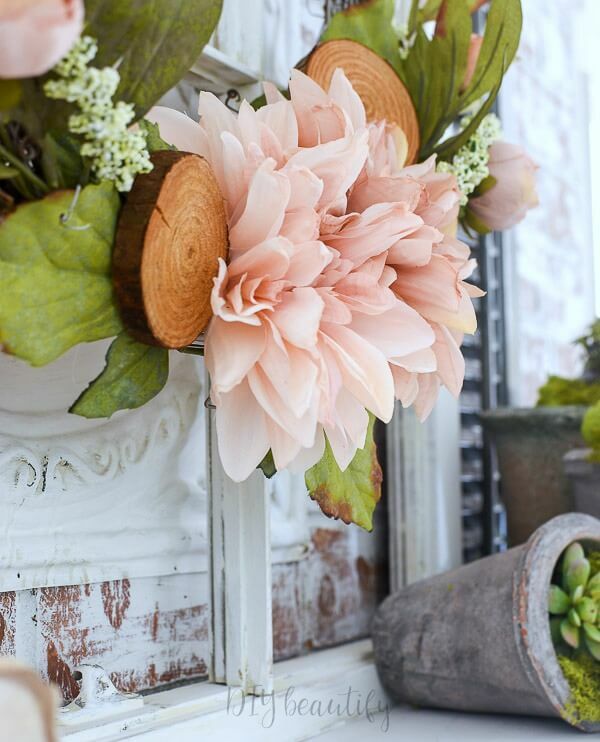 Blush seems to be the color of Spring this year! I found this gorgeous blush ombre throw that perfectly paired with my vintage floral pillow cover and soft velvet blush pillows. 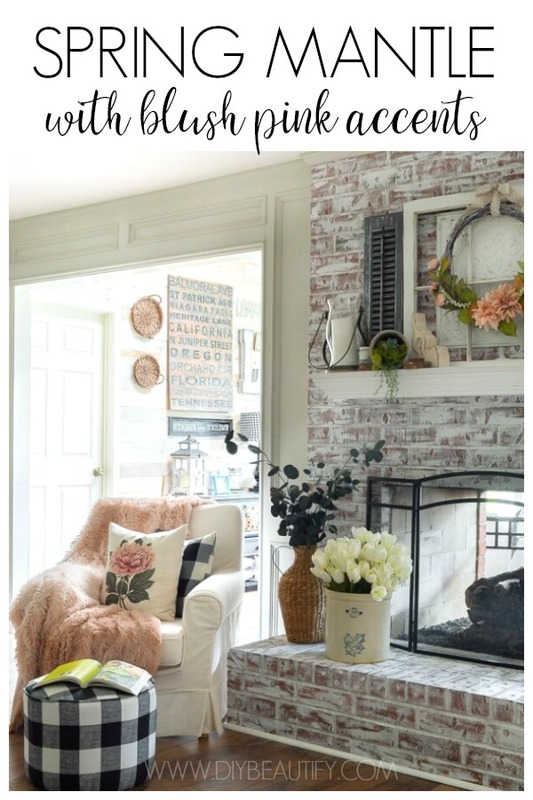 Some of these items are not new, and they're not available online anymore, but I tried to link to similar items if you want to incorporate this look into your own home! 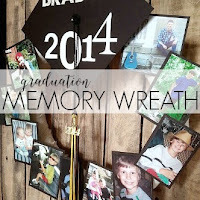 I began by layering an old window, and some small shutters in the center of my mantle. The wreath looked a little lost against my whitewashed brick fireplace, so I hung a chippy white ceiling tile from the window. That particular tile is currently sold out, but you can find some here. 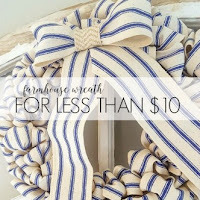 Adding that layer was not necessary, but now the wreath shows up much better! 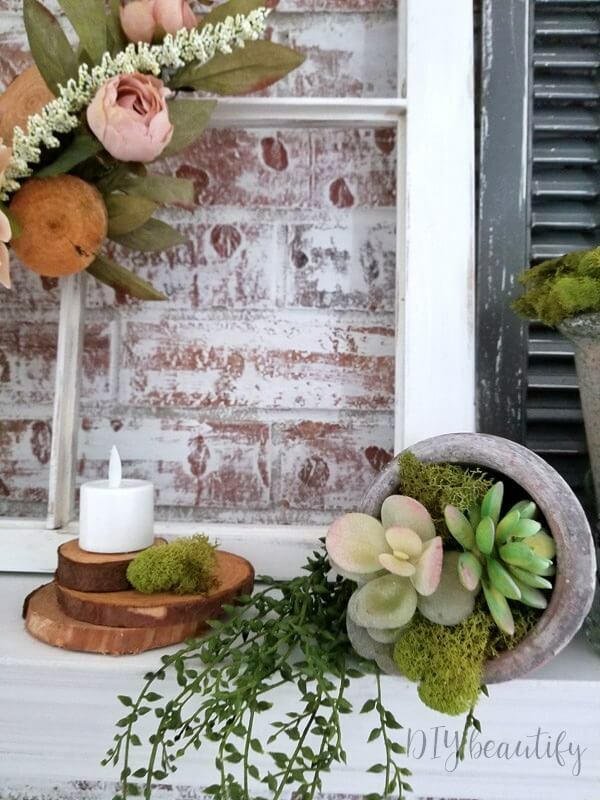 I added clusters of rustic flower pots, filled with dollar store succulents and spongy moss. 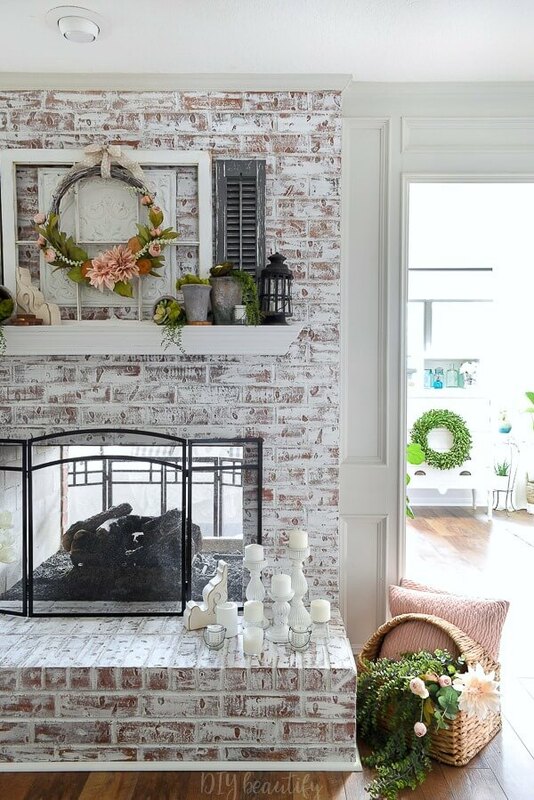 Small stacked wood rounds mimic the ones in the wreath and add a bit of rustic to this cottage Spring mantle. Our huge double-sided fireplace divides our living room from the sunroom. 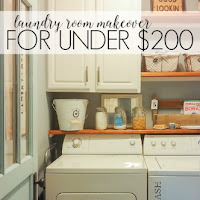 You can see a little peek at my cottage white dresser below. 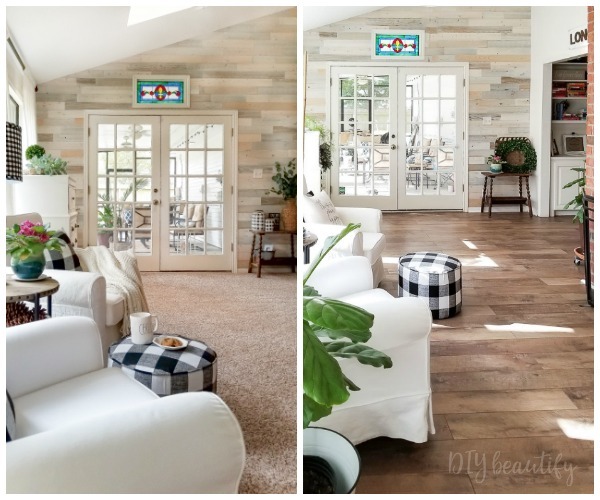 Last spring we ripped out the carpet and added these gorgeous farmhouse wood floors and it was the best decision! 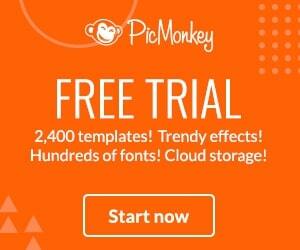 They are crazy affordable, you can find out more about them here. 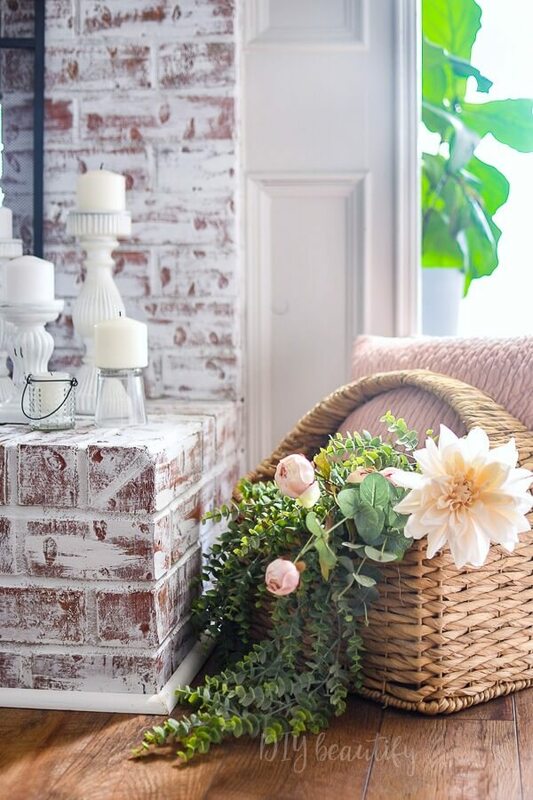 I filled a basket with more soft blush pillows, and added some greenery and a few more blush stems (all the flowers in this project came from Michaels). 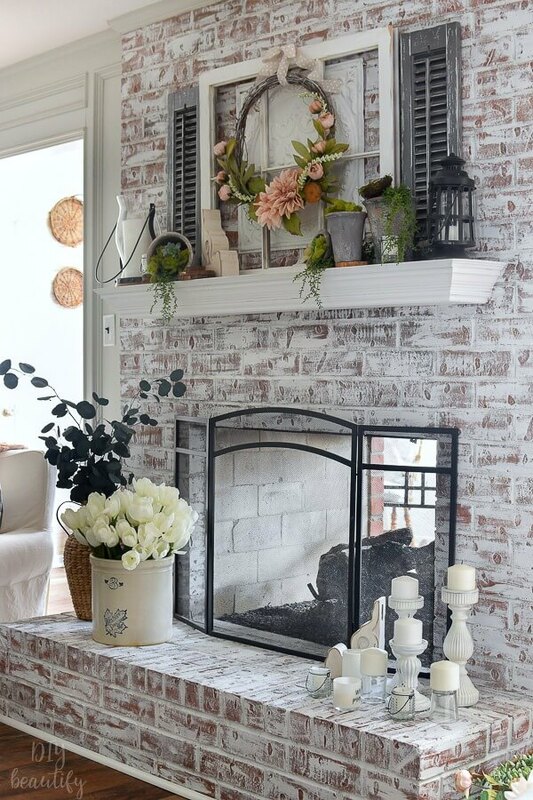 A collection of white candles on painted candlesticks adds a little something to the hearth on this side. 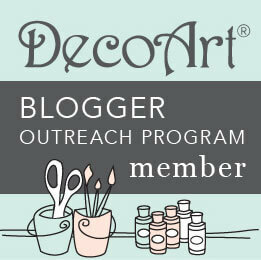 My white corbel bookends from Decor Steals are another layer that adds texture and interest. 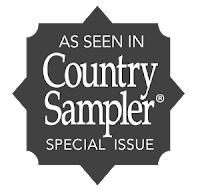 They're often sold out online, but you can find similar ones here and here. 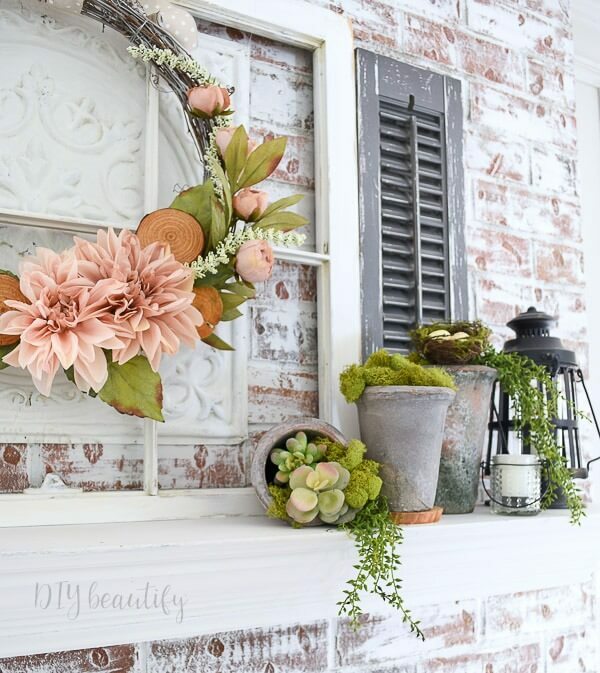 Spring is all about new growth, and although the majority of my greenery is faux, I like the look of it spilling out of the flower pots with tendrils hanging, and amassed on a wreath, spilling out of baskets. A cozy spot to browse through gardening books is a must this time of year! 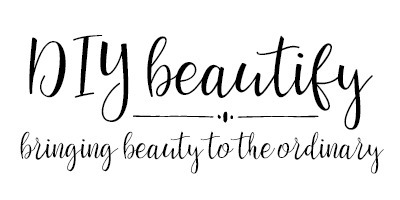 We are currently working on our front flower beds and I'm excited to get that project finished and share it with you! And that's a wrap on my Spring mantle! You can see more of my Spring and Easter projects here. 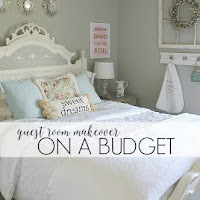 There's so much more inspiration coming up...be on the lookout for my Spring dining room/tablescape in early April, and then all the fun of our Master bedroom refresh! 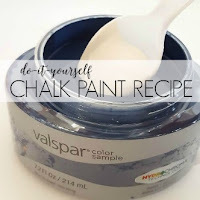 If you're not subscribed to my posts, click on the DIY insider box below! Spring weather fills me with energy and motivation to get stuff done, how about you? Are you the same? Cindy, I just love your fireplace! 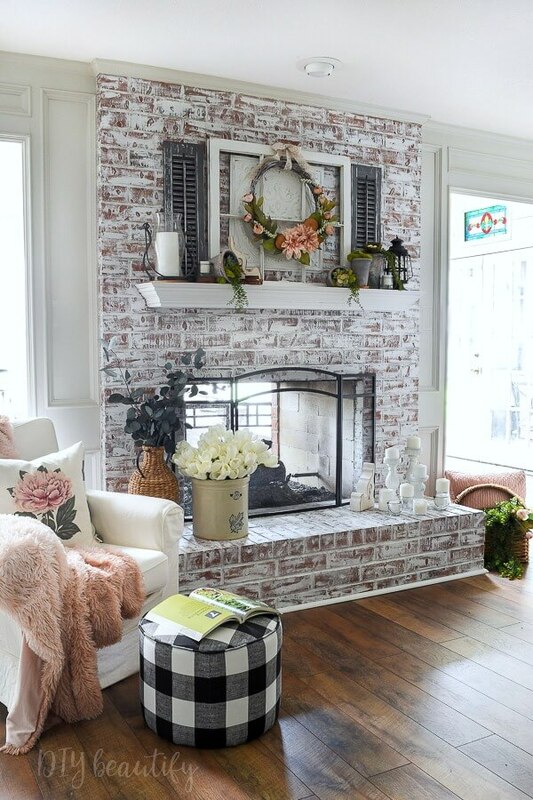 I love the whitewashed brick and the mantel itself. 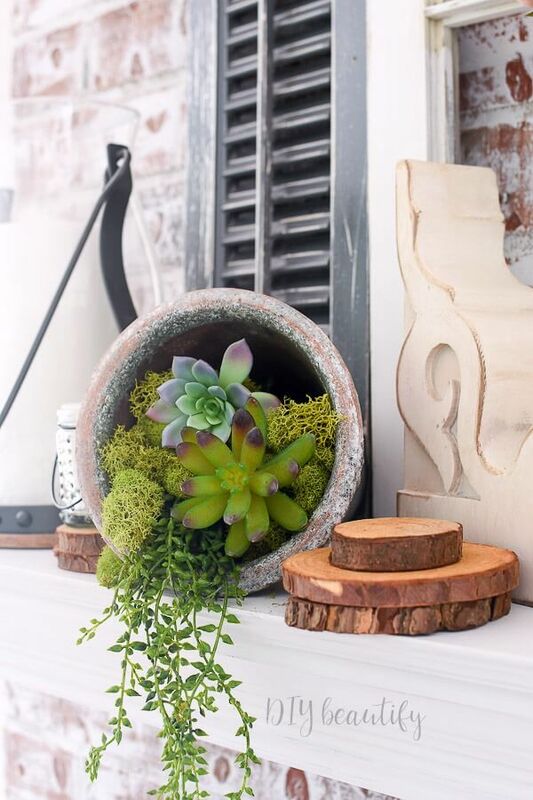 I love how you have the mantel all decorated up for spring with succulents, moss balls and terra cotta pots. 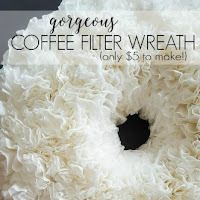 Your gorgeous wreath hanging from the window frame is such a nice finishing touch. So happy to be hopping with you this week! Thank you so much for your kindness! It brings me joy to inspire others!! Cindy this is just beautiful! I think I pinned all of your pictures because I love what you did! Thanks for sharing and happy Spring! Everything is so light and 'springy' but my favourite thing is the large floral pillow. So pretty. Oh my gosh! Your fireplace is gorgeous! I would kill for a fireplace like that! You did an amazing job decorating it. 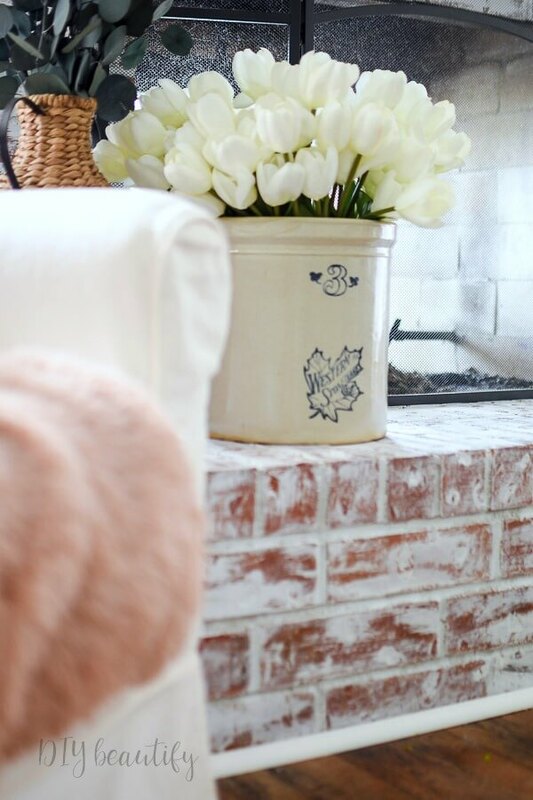 Love the flowers in the basket and the crock as well as all the layers on the mantle. Wonderful! 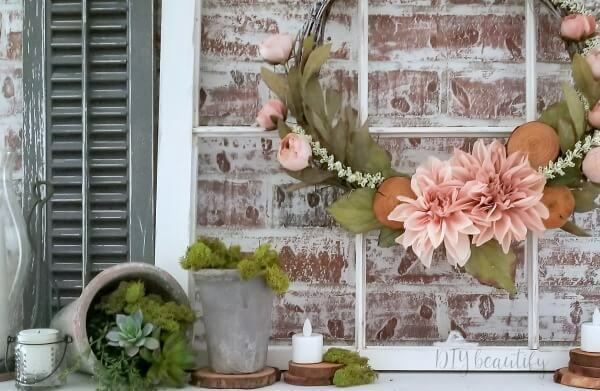 I love the blush with greenery, so classic and perfect for spring!! I love your fireplace!! So dreamy for Spring!